Go on a cartoon adventure and explore "Children's Games"
Click on the zoom tools to the right of the picture. Click on the painting then roll your mouse to zoom in on the blurred feet. See the cherubs' bored faces up close in "The Sistine Madonna"
Click on the painting then roll your mouse to zoom in on the cherubs. Look at the tiny dots of colour in close-up images of "The Circus"
Click on the painting then roll your mouse to zoom in on the tiny dots. Click on the painting then roll your mouse to zoom in. Zoom in on the swirling brushstrokes in "Woman with a Parasol"
See pages 4-5 in your book for more information. Scroll down and click on an animal. Click on the first small picture then click on the arrows at the top. Click on the first picture then move your mouse to the right side of the picture and click on "Next". Click on the picture then roll your mouse to zoom in. Scroll down to "Top 5" and click on a subject. Bring a painting by Wassily Kandinsky to life! Can you spot the details from paintings by J.M.W. Turner? 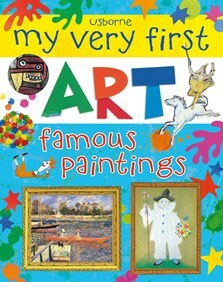 There are dozens of famous paintings for young children to discover in this bright and beautiful introduction to some of the world's most evocative artworks. Each painting has been specially chosen to appeal to young children and is accompanied by interesting facts about the artist and the ways in which they worked. Includes ‘Try it yourself' sections suggesting ways to experiment with different mediums and techniques as seen in the paintings. With links to recommended websites to discover many more famous paintings and artists.